This morning I was trying to find a plugin for Wax 2.0 and I found Wink. This is an open source tutorial creation software. I’ve been wanting to embed Flash into my blog postings, and Wink creates flash demos. I have been using ActivePresenter. However, ActivePresenter puts their advertisement on the presentation. I quickly created the beginning of a demo for posting data to Reddit via Python. I have been using Python to post to Reddit and, like all my projects, I like to document how I created them. Wink provided the perfect solution. So, I thought I would try it out. I’ve only created the rudimentary parts of the demo. However, I have a lot of other things to get to today. This was only an experimental tutorial. It only took me about half an hour to create this much, which is fast for tutorial creation software. The link to the demo is below. Click here to view my quick and dirty demos at earlmcgowen.info. The weather today has been wet, and this morning it rained fairly hard. On a day like today, it can be a little nice to sit back and relax. On this cloudy Sunday afternoon, I have created another quotation video. I am using Wax 2.0 to edit the video. The theme of the quotations are taking action since I need dose of motivaiton lately. The quotes are from Dante, Jefferson, Mark Twain, and Einstein. I choose the quotes more for the speaker than the content of the quote. I will not be diagramming these. I hope you enjoy! Below, I’ve linked a Wax tutorial that I have previously made. A little boring, but I wanted to try Vimeo. I have never linked a Vimeo video. In celebration of the 4th of July, I have diagrammed a Thomas Jefferson quote. I’ve embeded the following google maps from a created map. Wordpress.com will remove the iframe tags from google maps and add its own custom from. This works fine with regular maps but if you are trying to publish a customized map it will publish the whole page. At the end of the created wordpress tag remove parameters for height and width. Replace it with an embed code. Nelson Mandela has been admitted to a hospital and is in critical condition. Mandela is my favorite living hero. I find it amazing that he fought for his people and was imprisoned for 30 years. When he got out, he forgave those that imprisoned him. What courage, intelligence, and love. For a tribute to Mandela, I diagrammed one of his quotes. The NSA and the Confidence Interval! Most articles I have read automatically assumes that 51% confidence means a 51% probability. There is something wrong with making that assumption. Statisticians reserve the word confidence to mean something other than probability. So, what is confidence in statistics? That is what this post tries to explain. Confidence in statistics relates to the confidence interval and is more akin to the accuracy of the probability. When the statistician takes a sample from the whole population, they make a calculation about the probability based upon the sample; confidence tells us how well the probability of the sample might match the actual percentage of the population. From our NSA example, let’s say that a key term gives a 90% probability that the communication source is a foreigner. That is the probability. The statistician has taken, let’s say, 1,000 people and has found that 90% of that sample that use the key term are foreign. However, the statistician realizes that there might be some difference between the 1,000 person sample and the whole population. We might find a 90% probability of foreignness in the sample, but the percentage of foreignness of the whole population could be 93% foreign. That is why you see statistics that say, “There is a 90% +/- 5% probability.” The 5% is the error rate that accounts for this probable difference between the sample and the whole population. That error rate is what statistical confidence is about. The statistician has a certain level of confidence that the key word has an 85% to 95% probability of being from a foreign source. But, how confident are they? The larger the error rate the more confident the statistician is in the calculation. Think about it. If a key term has a foreign source 93% of the time in the whole population, a probability of 90% +/- 5% from the sample data will capture the whole population, but a probability of 90% +/- 1% won’t. A statistician has a higher confidence in the 5% error rate than the 1% error rate. When a statistician says that there is 90% +/- 5% probability of something, a key piece of information is being left out, the confidence. Usually, you can find the confidence in the small print below a publishes statistic. The statistician will calculate the confidence of the error rate. A 90% +/- 5% probability may have a 95% confidence. You can see why statistics uses a separate term for confidence. It would get confusing to write that it is 95% probable that it is 90% +/- 5% probable. There are three common confidence rates that statisticians use: 68%, 95%, and 51%. Next time you see a statistic that says 75% +/- 5%, look around for the small print showing the confidence. 68% may seem strange, but it has to deal with how confidence is calculated. Just know that the two most common confidence intervals are 68% and 95%. 51% is very rare because it has such a low accuracy rate. There really is no difference in the population, sample, or the calculation between 68% and 95% confidence. It is like the difference between 6 or 1/2 a dozen; or the difference between 90% foreign and 10% not foreign. Most lay people might be a little surprised that the error rate is this arbitrary. We can have 90% +/- 5% probability with a 95% confidence, and the exact same data can have a 90% +/- 1% probability of being foreign with a 68% confidence. Since it is a little arbitrary, how do statisticians pick the confidence rate: 68% or 95%? I will have some mathematician angry at me, but it depends on how well the sample matches the whole population and which one looks best. If the data matches poorly to the population, it looks better to use 68% confidence. Let’s say the probability is 75% and the error rate is 25% with a confidence of 95%. A statistician might reduce the confidence to 68% since saying there is a 50% to 100% probability really doesn’t convey well. Saying a 65% to 85% probability with 68% confidence, looks a little better. Conversely, if the sample data matches the population really well, and the error rate is low, statisticians love to brag and point out that it has a 95% confidence. The confidence rate is usually in the fine print below the published statistic. You will probably notice, from now on, that large error rates use a 68% confidence, and you will really notice that when an error rate is really low, the 95% confidence rate in the small print is very discernible. Statisticians love to brag when there numbers work out well. I don’t think that this adds anything to the privacy and security debate. They are just using the wrong term and should be saying a 51% probability to mean probability and not confidence. First, as I stated, 51% is really low and almost never used. Also, we don’t know what the probability is. You could be 51% confident that a key term has a 0.00001% probability of being foreign, which I am pretty sure this isn’t what they mean. Confidence could also be a legal term, like beyond a reasonable doubt or a preponderance of the evidence. Nevertheless, this has given me a good opportunity to explain the difference between the statistical terms, confidence and probability. 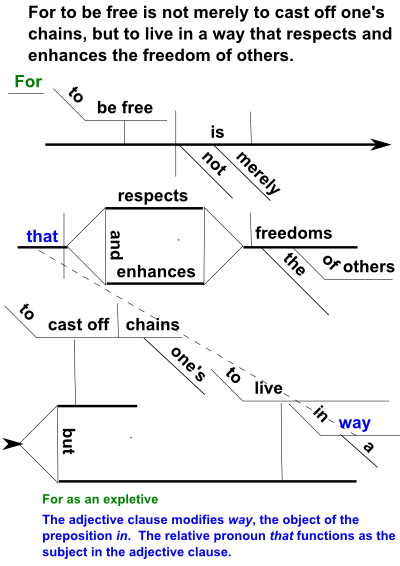 I haven’t posted my sentence diagrams for some time. This is one I did this morning. It is a quote by Sun Tzu. The adjectival clause who sets an entire army into motion to chase an advantage functions as a modifier of one and is introduced by the definite relative pronoun who. 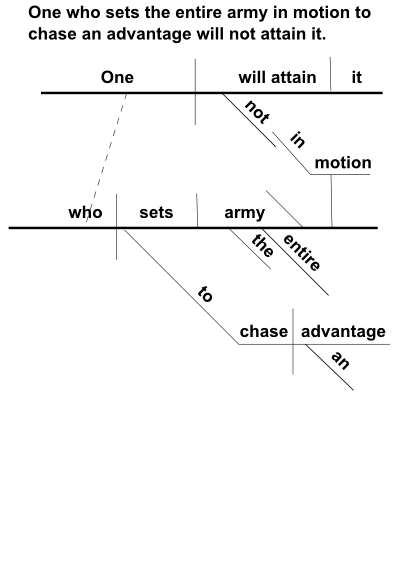 In motion is an objective compliment of the verb sets and completes the direct object army.